I am not trying to imply that frontline staff are comparable to termites in referencing this article, but merely pointing out that the decentralized, emergent behaviour the article below describes is, in its best form, a metaphor for the power of empowering the people at the frontline of an organization who work in the actual process, the Gemba, to innovate and improve a process, guided by a few simple but important guiding principles, rules, or logic filters. Termite mounds may reach as much as three metres towards the sky—quite an achievement for animals that are but a few millimetres long. And these mounds are not mere piles of earth. They have clever air-conditioning systems, which use convection to keep things cool; some are even aligned north-to-south, to avoid the worst of the midday sun. Termites also build sheltered tunnels from their mounds to the outside world, to keep themselves safe while they are foraging. Individual termites are, of course, far too dim to understand such things as convection and solar flux. Instead, a few simple rules encoded in their nervous systems by evolution and regulated by signalling chemicals called pheromones steer them to produce their mounds in all their architectural glory. This kind of behaviour, in which simple actions combine to produce sophisticated results, is called emergence. Now human designers are getting interested in emergence, too. 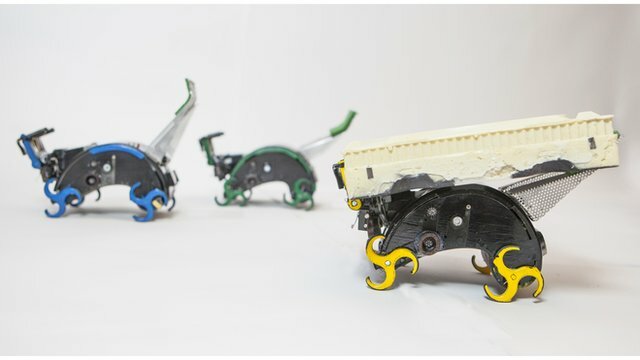 In a paper just published in Science, a group at Harvard, led by Justin Werfel, describes termite-inspired robots that can build things by combining magnetic bricks of a standard size. All their human controller has to do is program them with a few appropriate rules and leave them to get on with it. Robot construction teams are not, in themselves, new. Researchers at the University of Pennsylvania have already demonstrated a system which uses remotely controlled flying robots to build things. What makes Dr Werfel’s approach different is that instead of having a controlling force, in the form of a computer program, sitting at the centre telling everything else what to do (as was the case in Pennsylvania), control is distributed throughout the system’s components, which cannot communicate with each other. The robots, which are little wheeled contraptions, do not need to see the bigger picture. In the case of termites, the bigger picture is provided by natural selection, which has, over the millennia, refined the rules that individual termites obey. In the case of Dr Werfel’s robots, a human designer specifies the desired outcome and, with the help of a program developed by the team, generates the rules that will lead to its construction, with which each robot is then programmed. All that remains is to place a foundation brick to show the robots where to start building. The robots use this initial brick to keep track of where they are. The rules they have been fed consist of a list of actions they are allowed to perform at any given point in a three-dimensional grid whose axes originate, in their tiny minds, from this brick. Such actions include things like “move forward”, “move backward”, “place a brick”, “climb onto a brick” and “climb down from a brick”. 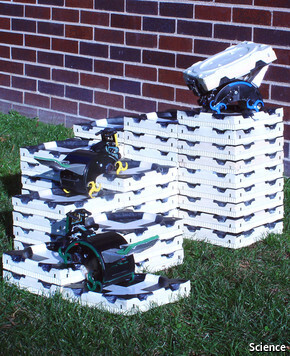 If a robot finds it cannot perform a particular action (usually because a brick has been put in the way by one of the others), it will move on and find something else to do until, eventually, the desired outcome is achieved.